Days after holidays are my favorite Facebook days! Drifting off just a little when SUDDENLY….. This line, from the song, “Change Our Hearts” by Rory Cooney, really spoke to me this week at Mass. I’ve always liked the song but I caught site of that line and it made me think of the peaks and valleys of my soul. I never think of my soul as having peaks and valleys. But that would make sense, wouldn’t it? There are times when my soul soars but then there are times when my soul is in the doldrums. We were talking about that very thing in our PRE class this week. We’ve been talking about prayer and this week we were talking about personal prayer. I let the 11th graders know that there would be times they really needed to take a break in their prayer life and that would be fine. But that their relationship to prayer was just like a good friend and it needed to be cultivated to grow. You’re not going to go a week without talking with your best friend, why would you go a week without praying? But the thing about this line in the song, mountains are glorious, if you’re on top. But they are very intimidating at their base. And if you have to climb that mountain that’s a lot of worry and work. But then the sand part. I love sand. I love the beach. But walking on sand is so hard to do. First, it’s hot. Then, if it’s loose, you early have to go barefoot, sort of like walking in mud. And if you walk out in the water then the sand slips out from beneath your feet. It is so easy to lose your footing. Isn’t that the same in prayer? There are times that you are not sure footed and some times the bottom falls out and you have to scramble to keep your footing. I guess the point is that no matter how hard we try there will still be things that force you to climb or that cause you to lose your footing. I guess we always have to be at the ready for that, and for the bridegroom. Whenever I was younger one of my teachers told me to hold my rosary like I was proud to use it. I’m sure you could imagine little stubborn Katie did not have any of it. Now I hold it higher than I hold anything else. I’m sure you all are wondering why I’m not in Washington D.C. God had other plans. Tonight I attended the rosary at the grotto. There are wonderful women and usually dad who will go through anything the elements throw at them to pray the rosary for anyone who needs it. Brothers and sisters, I come to you not to preach, but to encourage. You see, instead of being on a bus with other pro-life members, I was in Fancy Farm. I could’ve easily chosen not to go to the rosary. In fact, I was really thinking about it. I went. Silly me forgot her new gloves that her wonderful father bought her for the March. I got through it ladies and gentlemen. Tonight was the sorrowful mysteries and I cried because I wasn’t in Washington. I then calmed down. (I’m the master of silent crying.) If you don’t know, the fifth sorrowful mystery was of course the one that always hits home. Jesus dies on the cross. I bawled of course. It’s funny how He died for us on the cross and we take that for granted often. I know I do. We try to be holy. Like the red words say, the spirit is willing, but the flesh is weak. I encourage you all to come to the grotto. I know many of us try the New Year’s Resolution of losing weight. What about becoming more holy? Or at least try? The Lenten season is coming up and I cannot be more excited as I am giving up bread. (Except the Body of Christ obviously.) I encourage you all to come out to the grotto on Wednesdays at 5:30. Many of you go to The Stations of the Cross, why not come pray the rosary before it? I’m just asking for you guys to try. If you’re busy I understand. As for Washington I will be at the church tomorrow to pray the rosary, as will hopefully a bunch of others to pray for life. If you can’t come, pray at home! Below are my fingers freezing off, but if Jesus can suffer all he went through, I can get through the rosary on a cold night. I love the play “Godspell”. I love the music. And yes, I know that I am a child of the ’70’s but I could play that music over and over and over. One of the songs is Light of the World. “You are the light of the world”. Sorry, you’re going to have to listen to it. We are the light of the world. If we don’t shine for all the world to see, then what in the world are we doing here? I ask you, what? We are a reflection of all that we see and hear and learn and know. And as a light of the world then we shine all of that for the world to see. If we are not confident in who we are and what we know then it’s real easy to put that light under a bushel and then “it’s lost something kind of crucial”. We have got to let that light shine, we just have to. Today is the Feast of the Epiphany. Used to, the Feast of the Epiphany was celebrated on January 6th. I can understand why it now is celebrated between January 1st & 6th. It is important to be celebrated as a full community and the best way to do that is at Sunday Mass. This is the day of gift giving. There are those who wait until the Feast of the Epiphany to exchange gifts. I thought it would be cool to offer spiritual gifts today. So today I pray for my friends and family so that they will experience peace and good health. I also offer prayers of peace for our world. Fr. Darrell talked about the Feast of the Epiphany being a feast of light. And the readings today seemed to concentrate on the Star of Bethlehem. I love stars. Can you imagine being an amateur astronomer and seeing this star that is new to the sky? Can you imagine going back into your notes of all the stars in the sky and realizing that this star had never been in the sky before? Can you imagine going to your stargazing friends and conferring with them and then all of you decide that you need to scope this out? Can you imagine? Well, we have all been tapped to follow that star, haven’t we? We have been trained to take our notes and confer with our friends and to scope out what was in the sky so many years ago. And we have been tapped to spread that light wherever we can. I’m not talking about preaching about it, I’m talking about living it. We know how to live to share that light. We just have to do it. When I was looking at this day I found that today is the Feast of the Epiphany but it is also the Feast of the Holy Name of Jesus. It is also the feast day of Pope St. Antherus, St. Genevieve, St. Kuriakose Elias Chavara, St. Odilo of Cluny, St. Athanasius of Cilicia, St. Bertilia of Mareuil, St. Fintan of Doon, St. Gordius of Cappadocia, St. Theogenes of Cyzicus, Blessed William Vives, St. Zosimus of Cilicia, Blessed Arnold Wala, St. Bertille of Thuringia, St. Blitmund of Bobbio, St. Cyrinus of Cyzicus, St. Daniel of Padua, St. Eustadius, St. Finlugh, St. Florentius of Vienne, St. Florentius of Vienne the Martyr, Blessed Gerard Cagnoli, St. Lucian of Lentini, St. Melorius, St. Munchin of Limerick, St. Primus of Cyzicus, St. Salvator of Belluno, St. Theonas, St. Theopemptus of Nicomedia, St. Wenog, Martyrs of Africa, Martyrs of Tomi, Blitmund of Saint-Valery, Daniel Himmerod the Younger, Hymnemodus of Saint-Maurice, and Imbenia. The thing about all of these people is that they took the message that they were the light of the world to heart. They took their knowledge and their love of their faith and proclaimed it for all of the world to see. So even though they lived between 235 AD and 1871 AD they let their light shine and it is still shining for all of the world to see. If not, why would we care that today is their feast day? You are the light of the world, you are the salt of the earth, you are the City of God, but “you’ve got to live right to be the light of the world”. So is it time that you took after the wise men and the saints that have come before us and let your light shine? Is this the year for you? I think it could be. Well, funny you should ask. Because yesterday during Mass I was listening to the good news that Jesus is coming. Jesus is coming! Say that with authority. Of course, he is coming. It’s almost Christmas. Advent is the preparation of Christmas. It is the anticipation of the birth of Jesus. Yeah, we know. We’ve been here, this exact place, for years and years. We know. And we are excited about it. We are excited to commemorate the birth of Jesus. It warms our hearts. It is nothing less than love. Yes, we do get caught up in Black Friday and we might even put our Christmas tree up right after that wonderful Thanksgiving dinner we feasted on. We do this because we cannot wait for Christmas. We cannot wait to have the house decorated and the presents bought and then we can enjoy the Christmas season and be absolutely prepared for that day of love and happiness and joy and peace. We cannot wait. I can remember as a child, before we were allowed to tear into our toys that Santa had left us that we had to stop and pause, wish Baby Jesus and my mother Happy Birthday and then we could dive in. We had waited so long for this. And yes, Mom and Baby Jesus did get their mention. We would go to Mass after breakfast and then go to my aunt’s or grandmother’s and have a birthday party for my mother and aunt. So, we had our priorities right. Sometimes Mom would let us take our favorite toy to Mass with us, if we had been really good that morning. So, we all know that Jesus is the Reason for the season. We know. And we give Him his fair due. We kneel before the Manger and we thank God for the gift that is His Son. We do this. But, what would our life be like if we truly prepared ourselves for Jesus. What if we prepared ourselves, not for the Baby Jesus, but the returning Jesus? How different would our Advent, our Christmas, our lives be? Because at Mass the last couple of weeks we have been asked about Jesus coming again. Would we be ready? Oooh, I hadn’t thought about that one in a while. Would I be ready? I would hope so. But, let’s not give this is a pat answer. Let’s think about this. Would I be ready? Well, my house is a mess. I have just been so busy this year. Really, I have been so busy for the last two years. I started painting my living room two years ago and it’s still not done. Well, the living room itself is done. But the staircase going up hasn’t been touched and the accent colors haven’t been painted. But what about me? Well, you know, I’ve been busy. I just really haven’t had the time to take care of myself. I have gained most of the weight back that I had lost. I don’t exercise anymore. It hurts. I know that it hurt when I started the last time, but I got over that pain. So, my house, my body, is not ready. It’s just so much easier to take some Aleve and go to bed than to go hiking (something I truly, truly enjoy). It’s so much easier to play mindless games on the computer than to sit down and write what is in my heart. So, no, my house is a mess. I wouldn’t invite a delivery driver into my house let alone the One I live for. They say that acknowledgement is the first obstacle to get past. purge that which is bringing me down. We don’t want to go into my habits and finally break some of those. But what if I get rid of everything. Can I, will I, restock the shelves with the things I need in order to greet so great a Guest? Can I accumulate the graces needed to prepare for my Almighty God? Oh, I hope so. And if I do get myself ready for the Lord Jesus coming can I plan a party worthy of Him? I think I can. I think I honestly could do that. I surround myself with those that believe as I do. Yeah, big deal. The hard part is bringing those that don’t believe as I do and invite them to the party. What if they don’t believe at all? Could I invite them? What if they believe in Christ but not the way I do? Would they be on my guest list? Those people sometime can be stubborn. Those people sometime want me to believe as they do. I don’t want to hear what they have to say. Ah, but if I don’t listen to them how can I expect them to listen to me? Can I use my old adage, “can we agree to disagree”? Or can I show them, not tell them about my faith and what it can offer? I don’t want to preach or judge or anything like that. I just want to offer what my heart knows to be true. Hopefully others can see this in my everyday life. And if my heart is open to bringing these people in then shouldn’t my arms be just as welcoming? I don’t have parties at my house much anymore. I don’t want to have to clean the house and then do all of the shopping and cooking and then have to turn around and clean the house again. Is this just laziness or preservation? When I was growing up people came to our house all the time. They would just stop by. No one does that anymore. Those are some of my most treasured memories. Why can’t I have my house ready for whomever stops by? Why am I not prepared? Why not? I can’t give you a good reason, other than I am lazy or tired or worn. If people don’t feel welcomed in my home how in the world can I expect the Risen Christ to feel welcomed? I don’t want to miss out on his coming just because I’m too tired to be ready. So, during Advent, I’m going to make some changes in my home. I’m going to have the house ready. So, if you want to stop by, come on in. It won’t be perfect. I’ve never been a perfect housekeeper. I don’t have the patience for it. But it will be presentable. I’m going to do some exercising, and a little bit of dieting. I need to get my body ready for company. I’m going to have plenty to eat and drink. But I’m also going to rid my thoughts of past mistakes that I’ve been forgiven of. I’m going to rid my thoughts of negativity. And I’m going to replace those with good intentions and lots of prayers. I might even throw in some positive responses too. You all might need to remind me. And I’m going to be open to new friends. I’m going to hold tight to the ones that I have, and the ones I love, but I’m not going to dismiss someone because of the way they believe or don’t believe. Maybe they just need someone to open their arms and ears up for them. I am strong in my beliefs. I have nothing to be afraid of. And hopefully by the time the Baby Jesus comes into my life, I will be ready for the Risen Christ to come into my heart as well. I will say this though, Advent or not, my tree will not go up before the Feast of St. Nicholas (December 6th) and it won’t come down until after the Feast of the Holy Family. Please don’t take yours down Christmas Day. Oh, and if the Risen Christ shows up before then, hopefully He’ll have his Mother with Him. I love Her so. 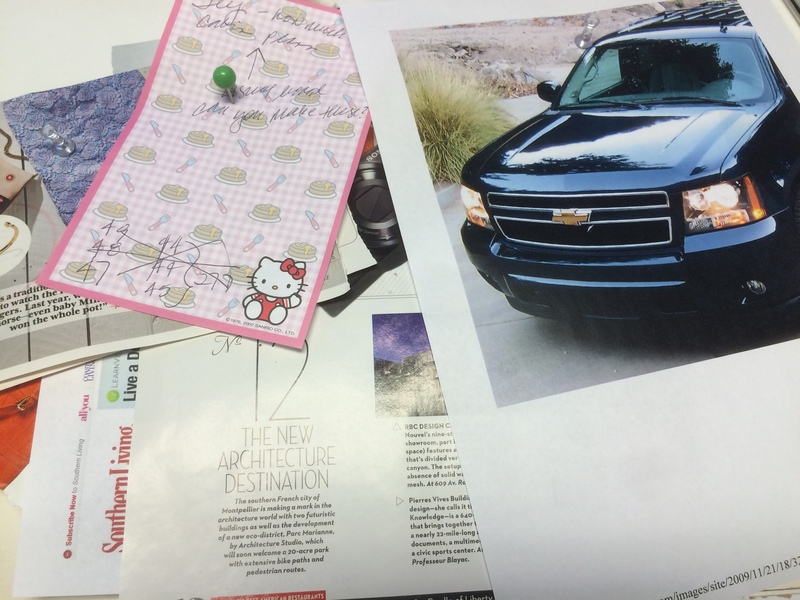 I am a firm believer in using a vision board. Mine is so full. I have my dream car, my vacation requests, jewelry that I love. I believe that if you can see it, you can achieve it. You see, I pray. I pray a lot. I ask the good Lord to take care of me. I ask the Lord to guide me. But, wait. Am I really asking for what I need or what I want? And in asking, am I asking for the right reasons? No, all of that stuff on my vision board is for me. I’m not asking for the things that matter. I guess I could argue that the things on my vision board are not prayer requests. But, if I’m asking the Lord to take care of me then I think I’m asking him to enable me to buy that swanky new car. Do I really need a new car? No. Do I really need that particular new car? Of course not. So why am I asking? All that other stuff, do I need it?